I sat in the Starbucks this morning sipping my cup of coffee and reading messages on my phone. From time to time, people who are homeless venture into this Starbucks. One older man wearing torn up clothes started talking about Palance. I tried to politely answer his questions while keeping to myself, but he just wanted to talk. So, I let him. I could tell he had a mental illness from what he was saying. He then told me he was an artist and made jewelry. He had a bracelet with him he'd give me. Something inside me told me to accept his gift, which I did. He put it on me and talked about how I should get a charm for it. He walked off and kept talking. I looked down to see a hunk of knotted up wire with a metal piece hanging from it. 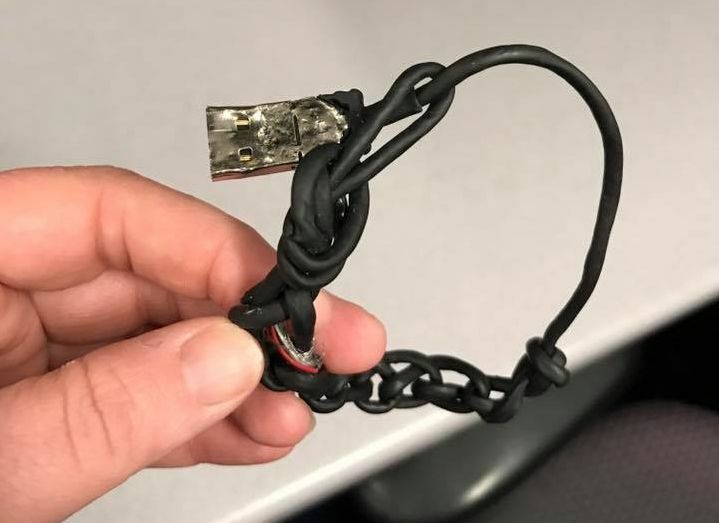 I soon realized that it was a broken USB cable. I thanked him again, got a spill stick, and left for my next bus. I have to admit I left faster than I would've normally because I was trying not to laugh in front of him. I was thinking "Bless his heart..." as I got on the bus and took off the "bracelet." When I got to the office, I stopped by the bathroom and washed my wrist and the bracelet (not to insult the guy but because I do tend to feel concern about germs). By the time I got in, I knew I wasn't going to throw away the gift. Theresa Weaver lives with her service partner, a black Lab named Palance, in Indianapolis. I'd like permission to republish this excellent post on United Methodist Insight (https://um-insight.net). Please reply to um-insight@as-tex.net. Thank you.